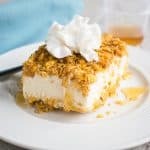 It’s easy to make Fried Ice Cream in a Pan! 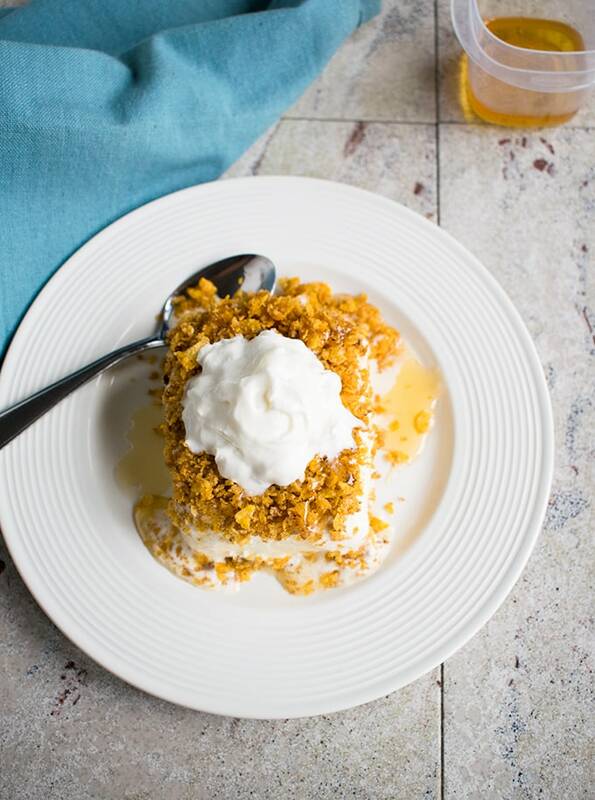 You’ll love this version with toasted corn flakes, butter, cinnamon, brown sugar and honey. 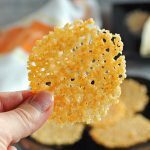 Such a fun and popular dessert! Check out the video too! Would you believe fried ice cream in a pan is the first thing I ever made from Pinterest? I’m talking back in the day, when I first joined and had 11 followers but no blog. It was so 2012. My family loved that dessert, which I served at least a couple of times. Then, I guess I got distracted by other goodies from my dessert archives and forgot all about it for a few years. Fast forward to earlier this week. My hubby politely asked if I “wanted to make something” he could bring to the office for a Cinco de Mayo celebration. But I knew what he was thinking. The air was heavy with expectation, as I pondered my response. Of course, I’d make something! But it had to be easy. Something I could squeeze into my schedule at the last minute… something tried and true…maybe a dessert…fried ice cream in a pan!! Bingo! I couldn’t find the recipe I’d used before. But it was easy to pull from various versions and taste test my way to something office worthy…and blog worthy. Because you need this recipe in your life. Let’s explore how it’s done. You’ll crush some corn flakes and toast them in a pan with butter. Then, you’ll stir in brown sugar and cinnamon. Then, you’ll probably burn your mouth while shoveling in a taste of that buttery, crunchy goodness. While the cereal mixture cools, you’ll stir your vanilla ice cream until it’s soft and smooth…like soft serve. Then, you’ll layer your 9×13 with some of that “fried” corn flake crust, all your ice cream plus another layer of crust. You’ll drizzle on some honey before covering and freezing the pan. Sorry, folks, but the fried ice cream needs to stay in the freezer for at least five hours before serving. 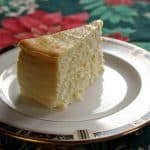 But once it emerges, you’ll cut it into squares, pour honey all over it until it’s dripping down the sides, then top it with a mound of whipped cream. It’s worth the wait. I promise. This recipe is great for parties or Mexican-themed dinners. You can serve this Seven-Layer Taco Dip from Scratch too. Or chips with my guacamole from this post on Basted Eggs with Guacamole Toast. It’s all good! Watch the video to see how easy it is to make Fried Ice Cream in a Pan! 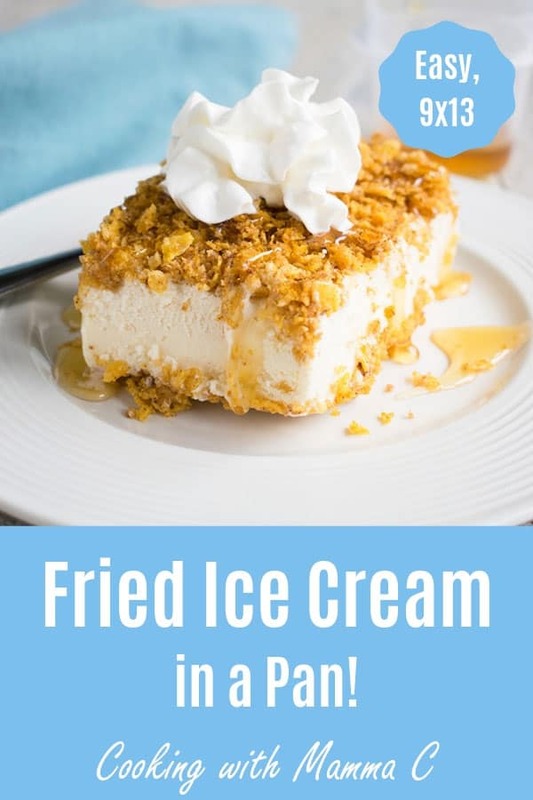 It's easy to make fried ice cream! Note, you'll need to let it freeze for at least five hours before serving. Set out your containers of ice cream to soften at room temperature. Have a 9x13 pan ready. 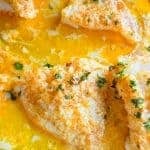 Melt your butter in a large skillet on your stove over medium-high heat. Add your crushed corn flakes and stir to combine. Stir constantly for about three minutes, until the cereal is toasted and fragrant. Turn off the heat. Stir your brown sugar and cinnamon into the corn flakes until combined. Transfer the mixture to a sheet pan to cool off. 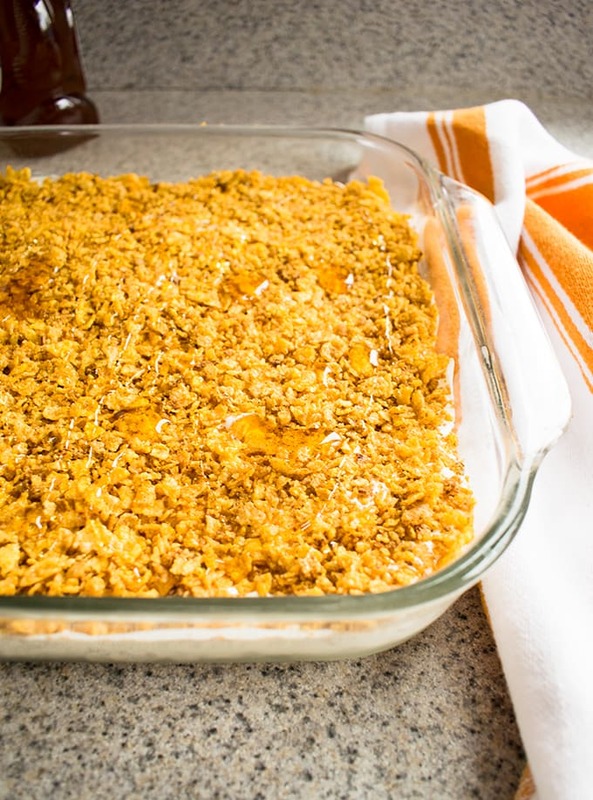 When the corn flakes are cooled off, place a layer of them in your 9x13, using just enough cereal to cover the bottom of the pan. Carefully transfer the ice cream onto the bottom crust. It helps to scatter dollops of ice cream all around the pan, then use a metal spatula to gently spread the ice cream in an even layer. 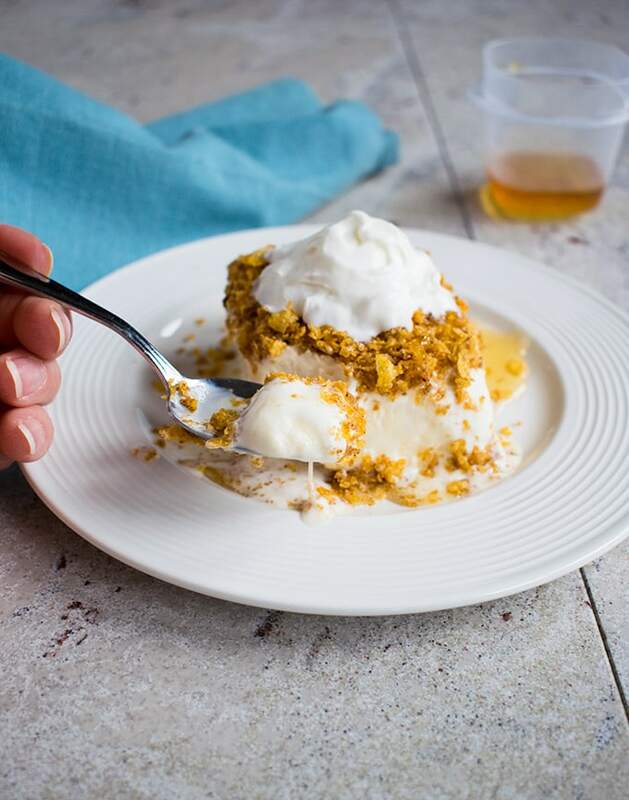 Sprinkle the rest of your crushed corn flakes onto the ice cream in an even layer. Gently pat the topping down with your hand. Drizzle on a couple tablespoons of honey. Cover the pan with foil and freeze it for at least five hours. 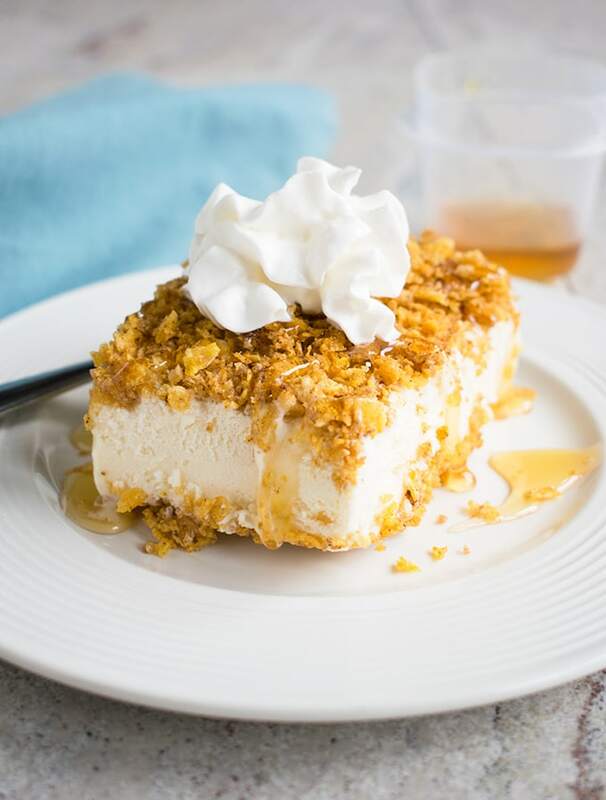 To serve, cut the fried ice cream into squares. Top the squares with additional honey and whipped cream. Store leftovers in the freezer. Notes: For a 10x15 pan, use 1.5 times this recipe. For an 8x8 pan, use half the recipe. Hi Sandie – I’m so glad you enjoyed it! Thanks for letting me know. Hi Danielle – There’s no need to grease the pan, since the corn flake mixture includes butter. Enjoy! Love this idea! It looks delicious!! It’s one of those desserts that makes people happy. Thanks, Bethany! This recipe was AMAZING! I am not very good in the kitchen, but I made this for Mother’s Day and everyone raved about it! Everyone had seconds or even thirds… Thank you for the awesome recipe!!! P.S. We sat next to you at La Campagna’s… Great company! Hi Tracy! I’m so glad this recipe was a hit. Thank you for letting me know! This will be on the dessert menu when everyone is home next weekend! 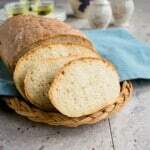 Thank you for the wonderful recipe, my friend! Your pictures are beautiful! So bright and inviting! How exciting that everyone will be home! I hope you guys enjoy the fried ice cream. I’m so glad you like the photos. Thanks, Annie! II love fried ice cream but have been to scared to try it at home. This looks like a delicious and safe way to make it! Nothing scary here! Thanks, Cricket. This is awesome!!! I would so make this in the warmer weather!!! Perfect for Memorial day picnic!! As long as you eat it before it melts! Thanks, Deanna. Yes, yes — in so many ways, yes! I am making this one when my daughter comes home from college!!! Haha! I always say “yes” to fried ice cream. 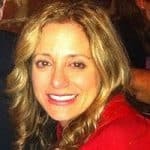 Enjoy, Lisa! What a festive an interesting dessert… I love it! It’s really fun and always a hit. Thanks, Hannah! Looks Yummy! First time I’ve seen Fried Ice Cream in a pan. Thanks, Commodore! It’s a big favorite in my family. I hope everyone enjoys it!